Even if you haven’t been to a farmers’ market or grocery store in the last two weeks, all you had to do was look at a local restaurant menu or your favorite chef’s twitter feed to discover that it’s pea season. Indeed, spring has flung upon us peas in every shade of green. This week only, This is Not a Pop-Up hosts kid chef Flynn McGarry, who is serving English peas with whey, parmesan, and lemon verbena. At Cafe del Rey, chef Daniel Roberts is serving a sweet and salty English pea agnolotti with bits of crispy pancetta. 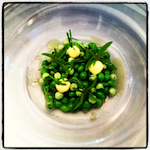 Rustic Canyon chef Jeremy Fox has been playing around with peas and their tendrils and greens all week. In addition to the heartbreads, pictured above with pea greens, he’s garnishing soups with perfectly crisp peas in their pod. Josef Centeno has paired peas simply with purple grapes downtown at Bar Amá. A simple crema is drizzled on top. Patina’s new chef, Charles Olalia, is just 29, but has a way with peas. His agnolotti are nearly neon green on the inside, and are served with steamed New York ramps. Bruce Kalman is pulling peas out of his ears at The Churchill. A pea ragout of sorts is topped with a freshly fried egg and lightly shaved parmesan. Over in Venice, Jason Neroni is playing with peas at Superba Snack Bar. Lately, he’s been serving crunchy peas with shrimp and house-made ravioli. Have you seen or tasted a pea dish that we should to know about? Tweet it to us @lamagfood.